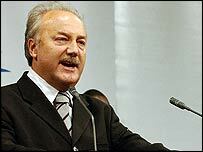 The Respect Party's George Galloway has taken the Labour safe seat of Bethnal Green & Bow in east London. 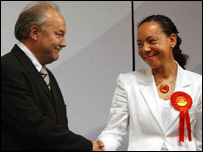 Oona King was deposed as the MP after former Labour MP Mr Galloway forced a 26.2% swing in his favour, following a bitterly fought campaign. Mr Galloway, who attacked Tony Blair in his acceptance speech, fought on an anti-Iraq war manifesto that appealed to the large local Muslim population. Ms King was one of Tony Blair's most loyal supporters and backed the war. Taking to the podium after his victory was announced, Mr Galloway said: "Mr Blair, this defeat is for Iraq and the other defeats that New Labour has received this evening are for Iraq. "All the people you have killed and all the loss of life have come back to haunt you and the best thing that the Labour Party can do is sack you tomorrow morning." He then attacked returning officer Christine Gilbert saying she had presided over a "shambles of an election which would disgrace a banana republic". Tower Hamlets council electoral office was also criticised for publishing an electoral roll "so shot through with errors and anomalies... as to be almost meaningless". A council spokesman said allegations of electoral malpractice were being investigated. Council leader Helal Abbas added it was "ironic" that he was criticising the very system that had elected him. In April, Mr Galloway claimed he was the victim of death threats by a gang of Islamic extremists as he canvassed in the constituency. Ms King had her car tyres slashed and was pelted with eggs and vegetables. Mr Galloway, who has said he will stand down at the next election, said the result was "sensational". Mr Galloway, 50, overturned a 10,057 majority for Ms King at the last election, polling 15,801 votes to Ms King's 14,978. Mr Galloway was gracious towards Ms King, thanking her for her eight years of work in the constituency and describing her as an "able person who will be back in politics and Parliament". "It was not her defeat. It was a defeat for Tony Blair and New Labour for all of the betrayals," said Mr Galloway. Ms King said: "It has been the best job in the world and I have been so proud of what Labour has achieved. "Labour Members of Parliament working with a Labour council, working with a Labour government to make real improvements in the lives of people here."